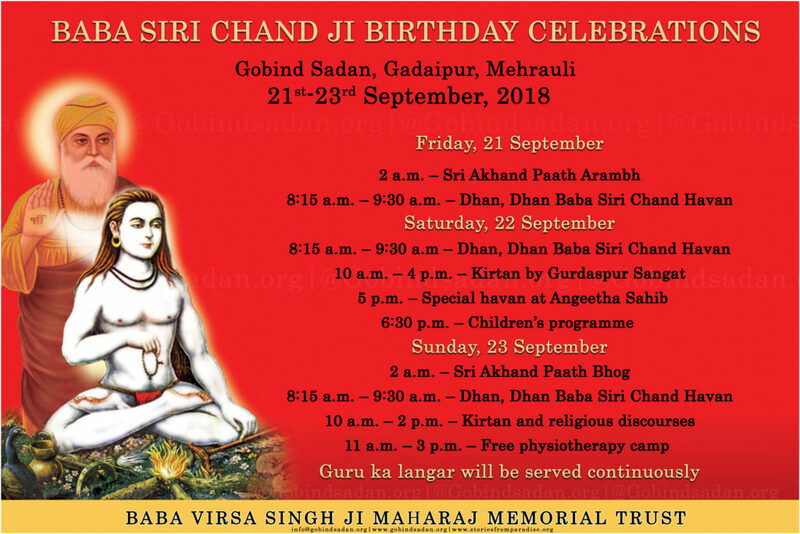 Gobind Sadan "God's House Without Walls"
In spite of rain, sometimes heavy, the sangat’s spirits were undampened as they celebrated Baba Siri Chand’s birthday with great love and respect at Gobind Sadan from 21 to 23 September. Especially lovely decorations were arranged for the diwan hall and Baba Siri Chand’s havan, and delicious langar was served throughout. Seven Akhand Paaths began at 2 a.m. on 21 September and ended at 2 a.m. on 23 September. On 22 September, hours of Jaap Sahib recitation was followed by kirtan by Gurdaspur sangat and other devotees, special havan at Angeetha Sahib, and a children’s programme. A guest of honour who spoke during the special havan was Sardar Manjit Singh Rai, Sikh member of the National Minorities Commission. He said, “I saw Baba Virsa Singh ji in 1980 for the first time, when I came to request him for recommendation for my service, but he only smiled, perhaps because he was seeing that was only a small thing for me.” Manjit Singh Rai then spoke about Maharaj ji, Baba Siri Chand, and Guru Granth Sahib’s message. The children’s programme at Angeetha Sahib opened with kirtan by Ekta Kaur, Prabhnoor Singh, and Jaspinder Kaur. Then followed a fine explanation of the mission of Baba Virsa Singh Ji Maharaj Public School by Yuvraj, a student of the fifth class. Anjali, Pooja, Kamini, and Khanak of the first class and Riya of the fifth class presented a delightful Jugni folk dance to Sufiana music. Naina of fourth class and Riya of fifth class sang songs about Baba Siri Chand, three boys of third and fourth classes recited Baba Siri Chand’s history, and Simranjeet Singh of Gobind Sadan recited a poem about Baba Siri Chand. It is quite noteworthy that all the recitations and songs were presented from memory in Punjabi, even though most of the children come from Hindi-speaking homes. After a bhangra dance by the school children, the programme ended with kirtan by Gursevak Singh jatha from Ludhiana, Bhai Lakhwinder Singh from Rajpura, and Bhai Gurdev Singh from Jallandhar, plus Dhadhi Karam Singh Sajan from Ferozepur. Gurdev Singh told the sangat, “Maharaj Ji was trained by Baba Siri Chand. What was that training? It was the mission of Guru Nanak. The Udasi sect was forcefully cut off from the mainstream of Sikhism, but Baba Virsa Singh Ji made efforts to unite them with the mainstream.” He then recited his poem on Baba Siri Chand. Dr. Avtar Singh Shastriy, General Secretary of Rashtriya Sikh Sangat, also spoke about the teachings of Baba Siri Chand Ji. Sri Ramesh Vidhuri, MP of South region of Delhi, spoke respectfully about Gobind Sadan and its sangat, which he said are doing a very good job of interfaith programming. MLA Sri Kartar Singh Tanwar, who is doing very good seva for Gobind Sadan’s functions and everyday needs, came to pay his respects and asked the management if the arrangements he had made for extra water supply were adequate.